Steve H. Chang, a Board Certified Ophthalmologist and fellowship trained cataract and refractive surgeon, is highly regarded both by his patients and his colleagues. He has been featured in several local and national news broadcasts highlighting his expertise. He also teaches and writes extensively and participates as an investigator in numerous studies to help advance patient-centered eye surgery research. As a result, he uses only the most up-to-date procedures that are proven techniques for delivering highly-personalized optimum results. 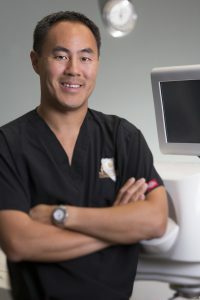 Dr. Chang was heavily recruited to Nevada Eye Consultants by way of the most prestigious eye center in San Francisco, where he was the full-time Director of Cataract and Lens Surgery. He was considered one of the most advanced cataract and refractive surgeons in the Bay Area having performed thousands of procedures utilizing the most advanced technology lenses and techniques. He was the only certified ICL surgeon in San Francisco, having received the Visian ICL Award of Excellence and featured on multiple newscasts both locally and nationally for his expertise. Dr. Chang is honored and excited to bring his care and services to the Northern Nevada population. Dr. Chang received his B.A. with Honors in molecular and cell biology at UC Berkeley. He continued his work at New York Medical College, where he received his medical doctorate. He then pursued further work at Cornell University, followed by Ophthalmology Residency at New York Medical College where he worked with pioneers in corneal and cataract surgery and was elected the Chief Resident. Dr. Chang then completed an additional year of specialized training in cornea, refractive, and cataract surgery at the internationally renowned Assil Eye Institute in Beverly Hills, CA. He is one of a select group of elite surgeons that has undergone this extra training to become a refractive and cataract surgery specialist. Dr. Chang believes in the power of refractive surgery and understands the life changing results as he underwent LASIK himself over 10 years ago. Dr. Chang lives in Reno with his wife and two children. In his spare time he enjoys skiing, playing baseball, basketball, and golf.